Jack Riely returns this cross country season as the likely top runner on the senior-laden Good Counsel team. He suffered a number of injuries early in high school but had a healthy junior season in which he finished fifth at the WCAC XC Championship and helped Good Counsel win the WCAC track title with personal bests of 4:26 and 9:42. 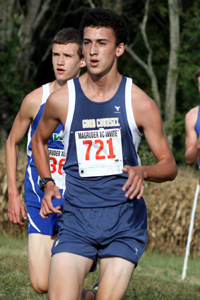 In this interview he talks about running for Good Counsel for three years, what it would mean to win the WCAC XC title in his final year, and he even makes some predictions about the MoCo public school runners. MoCoRunning: It seems like you have a lot of sisters. I'm not sure exactly how many. Do you have any brothers? How did your siblings influence your running as you were growing up? Riely: I have 3 older sisters, a sister that will be a freshman at GC this year, and a younger brother. So in total there are 6 of us. When we were little, we all ran track. But my first taste of xc came when my oldest sister started running cross country for Holy Cross. She eventually transfered to GC and started running for Coach Arnold and since then, there has been an unbroken line of Riely runners at GC for almost 9 years. I would go to alot of my sisters' meets and hear xc stories, so by the time I started running I felt like I knew the sport. But having an older sister be a senior on the team definitely helped me freshman year. MoCoRunning: It was clear that you were a strong runner as a freshman when you weren't injured. Did you have a lot of experience running and playing other sports before high school? Riely: I didn't really start running until 6th grade. Up until then, I played the usual sports. I really liked soccer, so I played until high school. I played basketball, swam and played lacrosse for a few years. Then I started running track in the spring and I liked it, so I dropped lacrosse. But I never ran xc until high school. The only 5k I ever ran before high school was once a year at a race held in honor of my sister's friend called Becca's Run. MoCoRunning: Injury continued to plague you into your sophomore year, but you seemed to have a nice healthy junior year. What have you learned about nursing and preventing injuries over the years? Riely: I think preventing injuries is all about doing the little things right and then being lucky. Stretching and icing are important. Normally at the first sign of an injury, I change shoes. I also try to avoid constantly running on asphalt and concrete. MoCoRunning: There were many heroic performances at the WCAC track championships last spring. What are you going to remember most about that wild weekend in which Good Counsel won its first WCAC track title in ages? Riely: There were alot of great memories from that weekend. The best was definitely the 4 by 4. It was the last event of the meet and at the start of the race, we were tied with Gonzaga. I remember standing against the fence with some GC runners and alumni as we added up the point totals for the last couple events and realized that we were tied. The 4 by 4 was great because Fola and Thomas Tallerico were part of it and they got to score the final points for our team to win it their senior year. 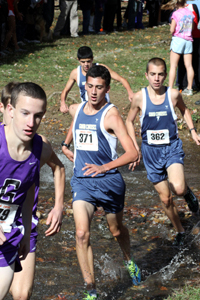 MoCoRunning: It wasn't long ago that Good Counsel won the WCAC cross country title with regularity, but as long as you have been in high school it hasn't happened. What would it mean to you and the other seniors on the team to win a WCAC XC title before graduating? Riely: Winning WCAC's is always the ultimate goal for every team in the WCAC. We can't run at counties or states, so our conference championship is a big deal. Winning the track championships was great, but winning it for xc would be on a whole different level. MoCoRunning: The Lake Fairfax cross country course seems to hold a special place in the hearts of all WCAC competitors. What is your opinion of it? Riely: Lake Fairfax is the toughest course I have ever run on, but I haven't run at Hereford so I can't compare the two. Lake Fairfax is the epitome of what a cross country course should be. It has good hills, two creek crossings, bad footing, an uphill start, and every year it seems to rain on that day so the last .1 is a muddy slide to the finish. MoCoRunning: Who had the idea for the Maryland flag shorts? 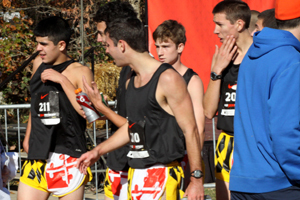 How disappointed were you guys when you saw Churchill wearing the same shorts at the NXN Southeast Regional Meet? Riely: I don't remember who had the idea for the Maryland flag shorts. I want to say it was a team decision, but it might have been Mike Fitzgerald's idea. We were all excited about how much the shorts would stand out and then we saw Churchill wearing the exact same shorts and color shirt. It was very disappointing but we all rocked the MD shorts, so it was alright. MoCoRunning: What do you enjoy most about XC camp? Riely: The best part about camp is finally being able to put a face and a personality to all of the names we see on moco every week. MoCoRunning: What team and individual do you think will win the MCPS county championship? Riely: If counties were this weekend, I think Zach would win hands down. So I think I am going to have to go all Churchill for this. On paper, they look the best right now and their top 2 will be hard to beat. So Zach Weinstein wins it individually and Churchil wins it as a team. MoCoRunning: How much have your eating habits REALLY been influenced by your oh-so-soft-spoken coach? Riely: Coach Arnold is our school disciplinarian. So he is at all of our lunches and can (and very often will) see what we are getting to eat and if we are eating pizza and fries instead of a salad, he will quite publicly call us out on it infront of our friends. So after a couple times of that, most of our team decided to start eating healthier. But no, we are not all vegetarians or vegans. MoCoRunning: Any early thoughts on a college choice? If not, what is your idea of a good college that you would want to attend? Riely: I haven't decided on a college yet but I am thinking somewhere either in the north east or north midwest. My top choices right now are Notre Dame, Dayton, and Villanova. Those are the respective colleges of my 3 older sisters so I know I've been able to look at each of them alot.